What is a Nevada Non-Disclosure Agreement? Nevada Non-Disclosure Agreement: What Is It? 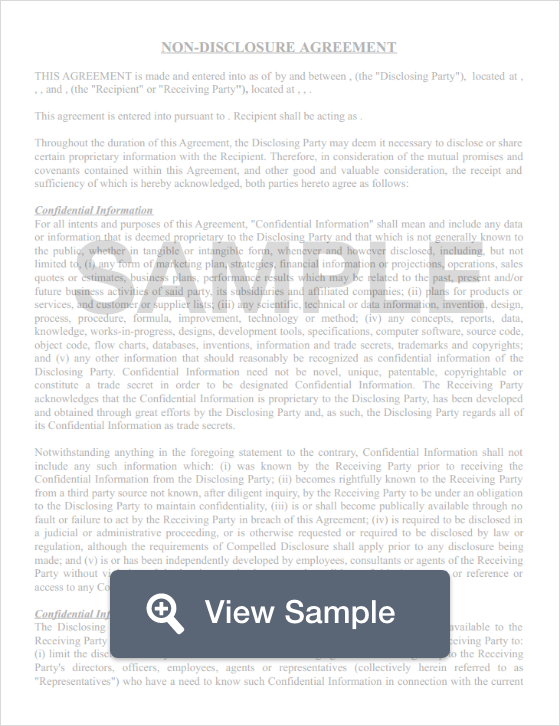 A Nevada non-disclosure agreement is known as a confidentiality agreement. Sometimes, Nevada non-disclosure agreements appear as clauses in employee handbooks or in employment contracts. They can also exist as a standalone legal document. The purpose of a Nevada non-disclosure agreement is to protect legitimate business secrets. Nevada’s Trade Secrets (Uniform Act), NRS 600A.010 through 600A.100, defines trade secrets as well as governs non-disclosure agreements. Business secrets are referred to in Nevada’s Trade Secrets (Uniform Act) as “trade secrets.” For information to be considered a trade secret, it must meet the legal definition of the term which is found in NRS 600A.030. It is information that is a formula, a pattern, a compilation, a program, a device, a method, a technique, a product, a system, a process, a design, a prototype, a procedure, computer programming instruction, or code. The law is very specific that there is no limitation. This information must have its own actual or potential financial value that comes from the fact that this information isn’t something that is known by or can be used by the public. It also cannot be something so simple that another business could easily discover the same information and use it to their benefit. A trade secret may not contain information that a manufacturer, a pharmaceutical sales representative, or a pharmacy benefit manager would be required to report. It is imperative that a business claiming a trade secret take reasonable steps to keep that information secret. Nevada’s Trade Secrets (Uniform Act) also explains that criminal penalties may be assessed for anyone who steals trade secrets, what a business can do if an employee or contractor threatens to or actually violates the NDA, and the steps a business should take to protect the secrecy of the confidential information. Although Nevada’s Trade Secrets (Uniform Act) is quite extensive as far as what may be considered a trade secret, it’s important that businesses take every possible step to protect their position in the competitive business environment. To provide an extra level of protection, use an NDA with a Nevada non-compete agreement.